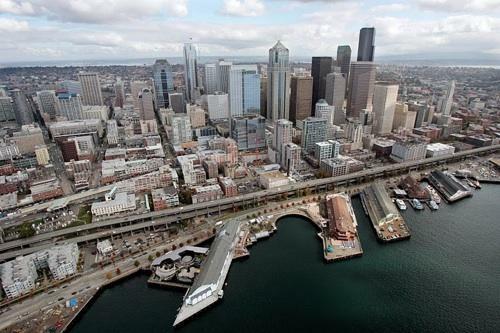 Seattle's Alaskan Way Viaduct (part of Highway 99) is moving toward replacement by a deep-bore tunnel, something Mayor Mike McGinn and others oppose. The planned tunnel to replace Seattle’s Alaskan Way viaduct will include tolls, and that will push traffic onto nearby streets and I-5, according to Seattle Mayor Mike McGinn. So, he’s hiring a consultant to look at ways to handle extra traffic. He says options include light rail to West Seattle, or renovations to I-5 through downtown. The Seattle Times reports McGinn spoke at an anti-tunnel forum last night. He was joined by Councilman Mike O'Brien, and representatives from Sightline Institute and Move Smarter Seattle. It became a one-sided event when the state Department of Transportation (DOT) and pro-tunnel City Council members declined to participate. "The debate about whether or not we're going to do a tunnel is over," explained Ron Judd, project outreach director. State officials plan to pick a winning construction bid on the tunnel this month. McGinn will be in West Seattle this evening for a community Q&A, at the Youngstown Cultural Arts Center, according to the West Seattle Blog. The topic of the tunnel is expected to be among the topics he'll discuss.